By Todd Cartmell, Used by Permission Focus on the Family. "Steven gets upset whenever something is difficult." "Zoe threw a fit at her brother's birthday party because she couldn't go on the trampoline with the older kids." "Jose argues about everything. It's a major battle when I ask him to turn off a video game." Kids need to learn a certain important skill, and if they learn this skill, it will help them respond in a much better way to the ups and downs of life. Moms and dads can help their kids learn this skill. The skill I am referring to is called flexible thinking — the ability to view life from another point of view. This skill allows children to cognitively flex when life's circumstances don't go the way they had hoped. Most parents respond to disrespectful behavior with discipline. We put kids in a timeout or give some logical consequence. On a good day, we may take the time to help kids understand how their behavior made others feel, encouraging them to make better choices next time. Discipline is good and necessary, but it's often not enough. When kids are confronted with the brutal reality that they cannot have a brownie right now or they have to turn off the video game and do homework, their negative thinking habit kicks in. This thinking drives their emotional and behavioral response. Negative, inflexible thinking leads to unhealthy emotions and poor behavior. But the reverse is also true: Positive, flexible thinking leads to healthy emotions and a better behavioral response. "Train up a child in the way he should go; even when he is old he will not depart from it" (Proverbs 22:6). This proverb has always been helpful to me in my parenting. Kids need more than discipline; they need training. They need parents who will teach them how to do the right thing so they don't have to experience what happens when they do the wrong thing — or at least not as often. Discipline tells your kids what to stop doing. Flexible thinking is what we want them to start doing. Step one is helping our kids understand that there are two possible types of thoughts when things don't go their way: flexible thoughts, which help them stay calm and make a good choice; and angry, inflexible thoughts, which often lead to bad choices and unpleasant consequences. I don't want to stop playing! Explain to your kids that when they let angry thoughts into their minds, they end up feeling angry and acting angry. Anger makes it easier to act in disrespectful ways, which is not how God wants us to treat each other. You win some; you lose some. There will be time to play tomorrow. I'll have a snack later. Ask your kids how they would feel and behave if their first response was one of these flexible thoughts instead of an angry thought. They might feel a little disappointed or frustrated, or they might feel just fine. That is the power of flexible thinking: It affects the corresponding emotions immediately, making it much easier to make good choices and treat others with respect. Like with any skill, time and practice are needed to replace negative thinking habits with flexible responses. Continue to brainstorm scenarios that allow your kids to practice this skill. Scenarios can include home, school and relationships, or any situation that doesn't go the way kids were expecting. Add age-appropriate scenarios as your kids get older and experience new challenges. Parents can also create an environment that intentionally encourages flexible thinking and provides quick and effective consequences for disrespectful behavior. Be on the lookout for any signs that your child has chosen flexible thoughts over mad thoughts. When you see your kids respond respectfully in a situation that didn't go their way, let them know you noticed their positive choice by giving them a compliment, a high-five or a gentle squeeze on the shoulder. By pointing out their positive words and actions on a daily basis, you help them see that flexible thinking pays off. When kids behave disrespectfully, you need to respond calmly and encourage them to make a good choice or use respectful words. Offer to help them think of a flexible thought if they can't seem to do so on their own. If they choose poorly, implement an appropriate consequence in a calm and respectful way. Of course, any situation that your kids handle poorly can be used later as a practice scenario to help them think of flexible thoughts more quickly next time. 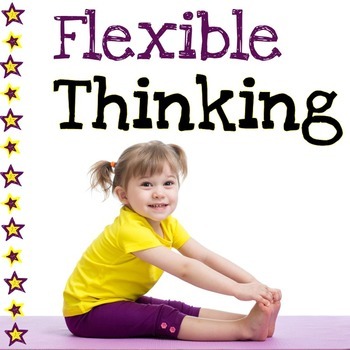 Flexible thinking is a skill that all kids need to learn. The good news is that they can learn it. But parents need to introduce this valuable skill, practice it with their children over time and create an environment that encourages flexible thinking and discourages angry thoughts and the disrespectful behavior that those thoughts bring. I know hundreds of kids who have learned to be flexible. Your kids can think this way, too. Dr. Todd Cartmell is a child psychologist and author who lives in Wheaton, Illinois. His most recent book is 8 Simple Tools for Raising Great Kids. Does God Teach Flexible Thinking? While you don't see the term "flexible thinking" in the Bible, the idea of flexibility is easy to see in the pages of Scripture. When the apostle Paul lists the fruit of the Spirit in Galatians 5:22-23, those traits include patience, kindness, goodness, faithfulness, gentleness and self-control — traits that work together for a calm, positive and flexible response to life's challenges. Likewise, in Ephesians 4:31-32, Paul exhorts us to get rid of all bitterness, rage and anger — and instead, treat each other with kindness and compassion. And in Philippians 2:3-4, we're encouraged to humbly consider others as better than ourselves, to look out not only for our own interests, but also for the interests of others. These choices — to act in a way that is gentle, kind, self-controlled, compassionate and considerate of others — require the ability to put things into perspective, look at situations from another point of view, and consider and evaluate various options. In addition to the willing submission of one's life and will to God, they require the skill of cognitive flexibility, a trait that God wants to grow in each one of us. There is a battle taking place in your child's brain between negative thoughts and flexible thoughts. To win this battle, I recommend that kids memorize a few flexible thoughts to be prepared for challenging situations. You can add to and customize this list for various situations. I should just do it. This flexible thought is designed for what your child should think when given a basic parental directive. Scenario: You ask your child to turn off the TV and come to the dinner table. It's no big deal. This one applies to many situations. Most things that don't go the way we want are not a big deal, and this flexible thought reminds your kids of that important truth. Scenario: You tell your child there is not enough time to watch a movie tonight. It won't take long. Many of the tasks, chores and requests that come your child's way really don't take that long to do — sometimes just a few seconds or minutes. Scenario: You ask your child to empty the dishwasher. The sooner I start, the sooner I'm done. This one is especially helpful for older kids as they experience more situations where a task or chore may take a longer time. Scenario: Your child needs to mow the lawn, study for a test, do a lot of homework or clean a particularly messy room. That's OK. I can do it later. This flexible thought applies to situations where a child wants to do something fun but is not able to do it right now. Your kids will use this one a lot. Scenario: Your child wants to go to Bobby's house to play Xbox, but you say there is not enough time today. Take time to help your child practice putting his list of flexible thoughts to use. Think of realistic life scenarios where something doesn't go the way your child was hoping or expecting. Then see if your child can respond with a flexible thought that will help him make a good choice in that situation. To illustrate the concept of flexible thinking for younger kids, you will need a rubber band and a pencil. Find a quiet place to sit down with your child, free from distractions. PARENT: (pick up a rubber band and stretch it) What is this? PARENT: Right. (Continue to stretch and twist the rubber band). And a rubber band is very ... ? PARENT: That's right. There's another word that means the same thing as stretchy: flexible. A rubber band is very flexible. It can be small or stretch over something big. But how about this pencil? Is it very flexible?" (Start to gently bend the pencil, showing how it is not very flexible). PARENT: Right. What will happen if I flex it too much? PARENT: Let's see. (Continue to bend the pencil until it breaks.) This shows what happens when we get mad and are not flexible. We break — we talk rudely, argue or throw a fit. So the rubber band stands for being flexible, and the broken pencil stands for getting mad. Which one do you want to be like? PARENT: So, when something doesn't go the way we want, we can think flexible thoughts in our brain or we can think angry thoughts. Flexible thoughts will help you make a good choice. Angry thoughts trick you into making a bad choice. Remember: Flexible thinking helps us make good choices! This article first appeared in the December 2017/January 2018 issue of Focus on the Family magazine. If you enjoyed this article, read more like it in Focus on the Family's marriage and parenting magazine. Get this publication delivered to your home by subscribing to it for a gift of any amount. © 2017 by Todd Cartmell. Used by permission of Focus on the Family.